It’s been surprisingly cool lately. Especially jarring since we just suffered through our hottest summer in history, but I for one am not complaining. Fall is my favorite season and if it has decided to show up early this year, so be it. Because of the colder weather, I wore pants yesterday for the first time in months. I should elaborate: jeans instead of shorts. It’s not like I was walking around in my boxers every day. Just in the afternoons, much to the consternation of my coworkers. In addition to being a cooler-than-normal month, September has also been super busy. We knew looking at the calendar that this would be the case. Hot on the heels of our mini family reunion, Tara, Audrey and I drove up to Mount Hood last Friday to hang out with my uncle Tom and his wife Sue before they flew back to New Jersey. 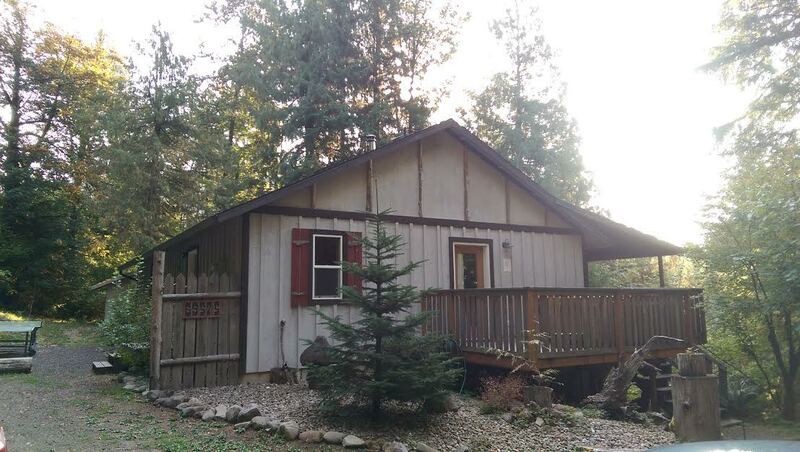 They had spent most of the week in a cabin in the woods, and invited us to join them their final night. You literary buffs and pro-abolitionists (better be everybody reading!) will appreciate the fact that we stayed in Uncle Tom’s cabin. We met up with them last Friday evening at a cozy little restaurant called the Rendezvous Grill in Rhododendron, where we enjoyed great conversation and food. I hate to use cliches like “my salmon was to die for,” but my salmon was to die for. As was Tom’s, and as was Sue’s. That’s right: we’re all a bunch of fish lovers. Tara and Audrey were the exceptions, ordering food that once walked instead of swam, but we all left quite pleased with our dinner, not to mention a little tipsy. Tom and Sue graciously picked up the tab; considering it was not insubstantial, we very much appreciated their generosity. 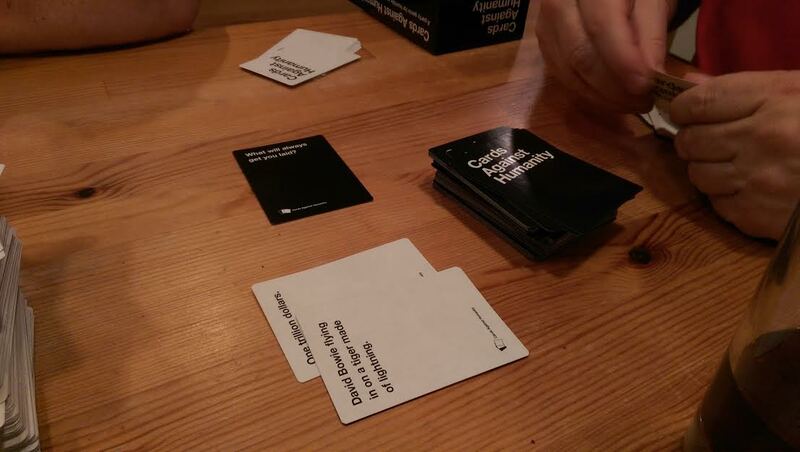 Cards Against Humanity: not for the faint of heart. Afterwards we followed them to the cabin, and the adults spent the rest of the evening drinking and playing Cards Against Humanity. Gulp. Talk about a family bonding experience! There’s an eye-opening game for you. But lots of fun. We enjoyed a dip in the hot tub out on the deck beneath the stars before hitting the sack. 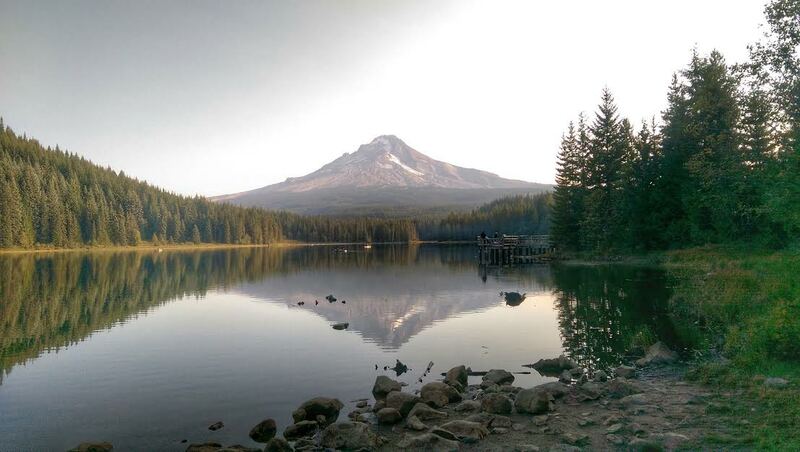 We were up four hours later to catch the sunrise over Trillium Lake, something that Tara had wanted to do for a long time. It was well worth the lack of sleep. After a hike around the lake we returned to the cabin and Tara cooked breakfast while Tom and I played a game of Scrabble. 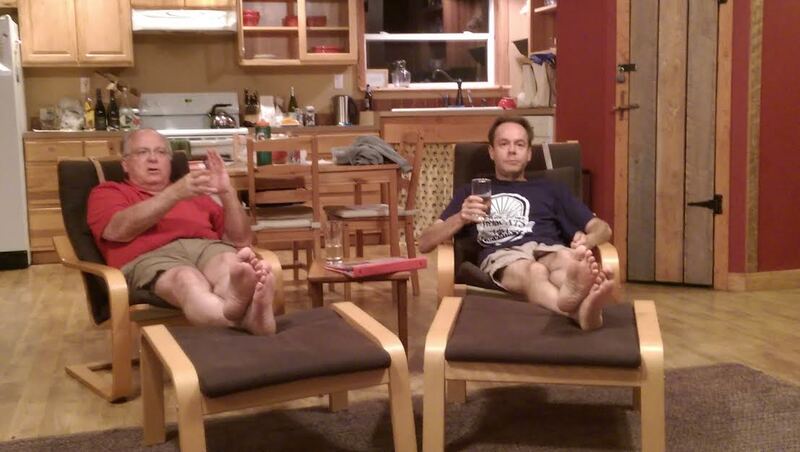 We’ve been playing Words With Friends for years, and Tom is my toughest competition by far. Who won, you ask? My answer is simple: it doesn’t matter, right? Then it was time to pack up; they had a flight to catch at PDX, and we had to get home. All in all we had a great 17-hour visit and enjoyed their company. Hope we get the chance to do it again sometime soon. Monday, Tara and I celebrated our second anniversary with a Foo Fighters concert at the Moda Center in Portland. Great show; Dave Grohl came out kickin’! Not literally, of course. In reality he spent the entire three hours seated in a giant, lavish, over-the-top throne that he designed himself while high on oxycontin after breaking his leg earlier in the year. This thing had flashing lights, guitar necks, and an elaborate FF logo. 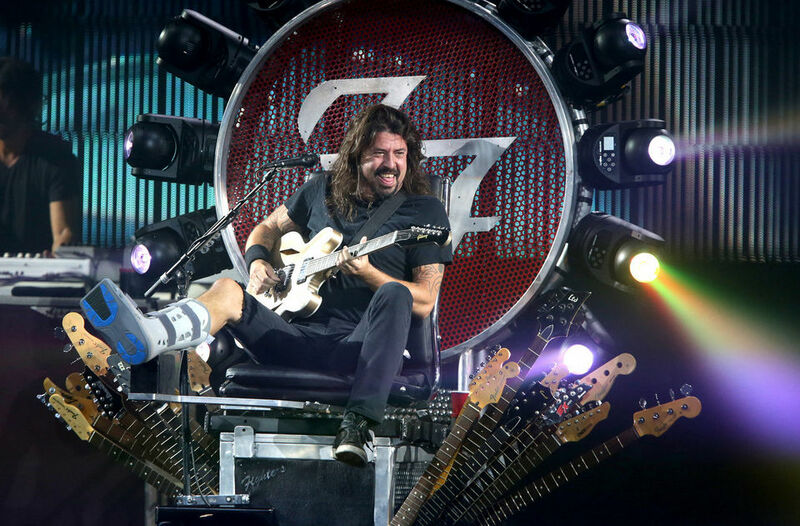 At one point, Dave played guitar with his leg brace. It doesn’t get more badass than that! Three hours and 25 songs later the concert ended, which meant another late night for us. But again, totally worth it. He’s Dave f***ing Grohl, man. Well, he IS rock royalty. (Image courtesy of nj.com). Because our anniversary landed on a Monday, we went out for dinner the evening before. We wanted something nice and were torn between three different Portland restaurants, but ultimately decided on Imperial because we are Top Chef fans and were cheering on Doug Adams last season. I thought he should have won, but after eating there I no longer think that. Because hot damn, that was one delicious dinner from start to finish. 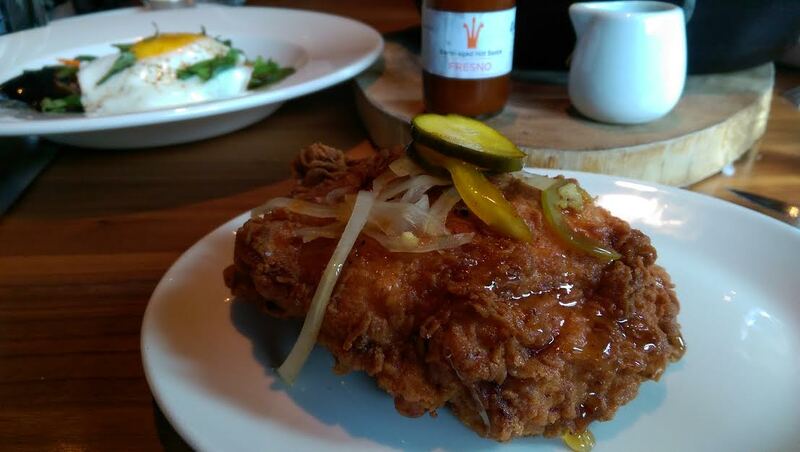 Everything was amazing, from my chipotle-infused Bloody Mary to the oysters with a horseradish mignonette; the giant, fluffy Parker House rolls with butter and Jacobsen sea salt; the buttermilk fried chicken with sweet pickles, honey, and hot sauce; the pasta carbonara with bacon; the caramelized green beans with kimchi, pork tongue, and a sunnyside egg; the fire roasted mushrooms with bone marrow and parsley; the warm chocolate chip cookie; and the cheese plate (a creamy wedge of bleu, wafer crackers, thinly sliced apples, honey, and candied walnuts). I’m much more cautious – okay, militant – over what I eat these days, but this was a splurge night and I’m glad I did. 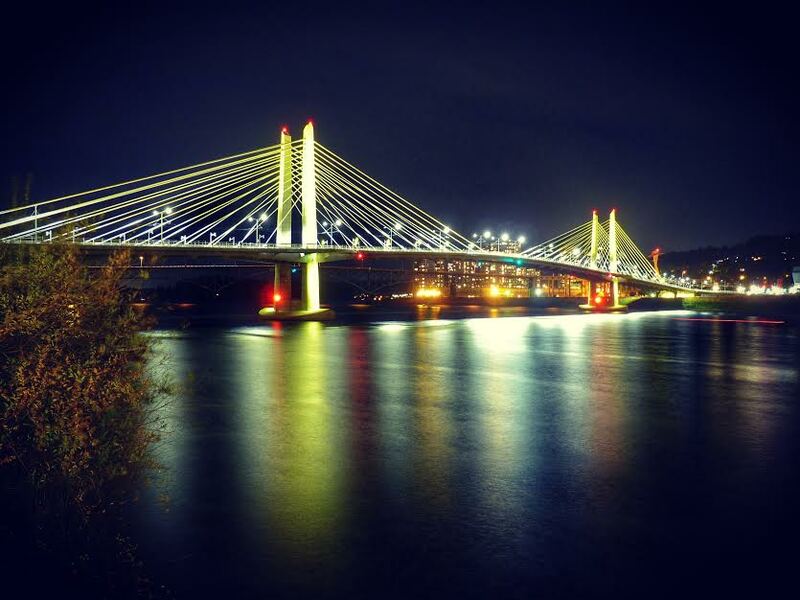 Afterwards we walked across Portland’s newest bridge, the Tilikum Crossing. All in all, we had a great anniversary this year. Our busy September continues this weekend with a camping trip on the Washington coast. It’s actually been two years since we’ve gone, and the weather looks to cooperate. Then next week we’re seeing The Who in concert, provided Roger Daltrey doesn’t keel over first. Oh, you think I’m kidding, but he has cancelled a bunch of tour dates due to a “mystery virus.” Portland is to be the first show they play once resuming their tour, so fingers crossed. At least tell me you break out the fine china for those special occasions! I think my china is made in New Jersey. Wow, Mark. What a fantastic life you lead! I plan to join you (in spirit) within the next two years. That’s actually true, you know. You are one of the bloggers who — by sharing how your life fell apart, and how you created something amazing out of that — inspired me to make some BIG changes in the way I do things. Life is already better, but I know that once our family can re-unite in North Carolina (where autumn often lasts MONTHS and winter just visits occasionally) it will be awesome. What a great compliment! Thank you, Renae. It’s such a rewarding feeling to have others find inspiration in things I have said or done. I am sure your life will continue to get better, too. Psycho on the big screen? Now, that would be fun! Sunday’s out but maybe next Wednesday is do-able. We’ll see. Happy anniversary! What a great weekend and celebration! I had not seen a picture of Dave with the leg brave, but I did see video of him recently rick rolling Westboro Baptist. Too funny. Anybody willing to take on the Westboro Baptist nut jobs is already a hero in my book. The fact that the guy’s got mad rock ‘n roll skillz is a happy bonus! I’m drooling now. Thanks. The food sounds amazing and all your photos are so stunning. The image of Lake Trillium is my fave. Breathtaking. I’m glad you had a wonderful getaway. Happy anniversary!!! Well, maybe one of those gigs will send him out this way. I’d go to his show. We can hope!